"I feel like something is missing from my life and that's why i'm not truly happy but I don't have a clue what it is"
If I had a pound for every time I've heard a variation of this script. "When I find the man of my dreams, I will be happy", "when I get that promotion, I will be happy" or even more elusive and undefined than that "Im waiting to reach the stage of life when I'm happy on a regular basis". Sure enough when they achieve or find the things that they are looking for they have a fleeting moment of happiness, but it doesn't take long for them to return to their happiness seeking state once again. It would seem that the feeling of happiness is one that is unsustainable. We should exchange our search for happiness for the gentle and more rewarding pursuit of joy. Both joy and happiness are lovely feelings to experience but aiming for joy is much more beneficial for our well being. Here's why. Happiness is generated by things happening to us. The stimuli for happiness is external to us, it relies on people, places, things and events. Joy is cultivated internally by making peace with who you are, why you are and how you are. Joy is more sustainable because it's generated from within us and only we have control of the thoughts that pass through our mind on a daily basis. Happiness is somewhat harder to manufacture because it is initiated outside of ourselves. It relies on other people following through on their promises, events going to plan, the weather playing ball and a whole host of other things that we have little to no control over. But many of us have lost the art of cultivating joy. We turn to quick fixes such as drugs, alcohol, tv, sugar (or bread and butter in my case), social media etc to provide us with little fleeting moments of happiness. They give us a momentary burst of happiness but moments later we're left wanting, or worse, regretting. The problem with this cycle is that it actually leads us further and further away from a contented life. In contrast, the pursuit of joy leads us to heal old wounds, bring light into darkness and inspires greatness to grow within us. Joy is really what you want. 1) Learn to truly love and accept yourself. Whatever brings people to my coaching room whether it be to build a business or decide on their next steps, I usually start with this. If someone has a healthy love and respect for themselves then they usually can't go far wrong in the decisions that they make. It's amazing how many people come to me for guidance and direction but when they really understand themselves and learn to love who they are, they almost instantly know what the right direction for them to take is. 2) Spend more time alone. I'm not telling you to ditch your friends and become a loner but spending some time alone teaches you how to be at peace with yourself. You learn to love your own company, forgive past thoughts and actions, heal hurts, care for yourself, and process emotions. Finding joy in your alone time will overflow into your time with others and you will soon become a person that others are drawn to. 3) Get out in nature. There's lots of science backing up the health and wellbeing benefits of spending more time in nature but it's my personal experience that nature stills the soul and teaches you how to extract pleasure from the smallest of things such as wave watching, looking at wild flowers, noticing the wind on your skin, watching trees sway and listening to birds sing. All of these things would go unnoticed in a busy, noisy, distraction filled environment. Noticing the small things and learning to take pleasure in them not only stills the soul and fills you with joy but it also enhances creativity too. As the saying goes, simple pleasures are life's treasures. 4) Foster an attitude of gratitude. Write a list of all the things that you are grateful for. Start a journal or just type them into the notes function on your phone. At first it can seem like an odd thing to do and you'll only notice the big things in your life "Im grateful for my home, my wealth, my health and my family". Your lists may start short but over time you will begin to learn how to be grateful for the smallest of things. "Im grateful for the natural light that floods into my bedroom each morning reminding me that today is a new day" - Exact from my own gratitude list from the other day. 5) Connect with a cause greater than yourself. Connecting with a cause gives you a perspective that you wouldn't have experienced otherwise and puts you into the path of people who live very different lives to you. It gives life a purpose and connects you with humanity in new and interesting ways. It provides another avenue for you to express sides of your personality and creativity that may not get a look in at work or home AND it makes the world better in the process. This weekend Leigh went on a surf trip up to the North East of England chasing a swell that meant he could escape the flat patch that were currently stuck in. This gave me some much needed time on my own so I planned a day in nature indulging in simple pleasures. I had so much time to reflect and plan and just be, it reenergised me for the week ahead. I soaked a cedar plank in water for a couple of hours and then nailed a side of salmon to it. I positioned a salmon close to the fire and let the smoke and the heat gently cook it. It took about 40mins to cook. I think I still have some perfecting to do on this so i'll write a blog post in the future with all the details once i've nailed it. I used a paella dish to brown some onion in oil over the wood fire and then added diced potatoes, chorizo and garlic. When they had browned, I sliced some halloumi cheese and served the salmon, potatoes and halloumi in a bowl. At about 5:30 when the sun has lost the majority of its heat I put the kelly kettle on and make some tea. I also cut a slit in a banana and filled it with chocolate, wrapped it in tin foil and put it on the embers. What a treat. See what I mean about simple pleasures being life treasures. It was seriously simple and utterly delicious. 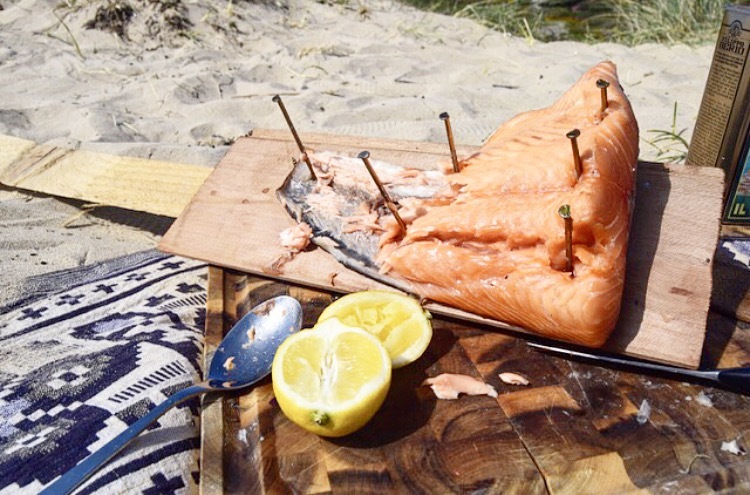 This blog post was inspired by the thinking and watching that I did on the beach that day whilst I was waiting for my salmon to cook. I hope you find it helpful.